The Ministry of Transport in collaboration with the National Road Safety Commission (NRSC) is setting up 100 Emergency Response and First Aid Posts at strategic locations along the major highways. Eight of such posts are already completed and fully equipped with medical supplies. This is part of measures to minimize deaths while sustaining the life of victims of road traffic crashes through emergency response measures. In an interview with Citi News, the Head of Communications at the commission, Kwame Kodua Atuahene said the facilities will be managed on a 24-hour basis by the Ghana Red Cross Society with support from the National Disaster Management Organization (NADMO), the police and the Ghana National Fire Service. The Commission is therefore asking the government to speed up processes to give it an Authority status. It says although giant steps have been taken towards the move, the government should not rest on its oars to give it more power to enforce road traffic regulations. 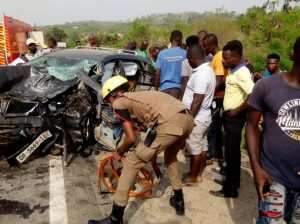 Kwame Kodua Atuahene bemoaned the Commission's current lack of the power to enforce road safety regulations insisting that the government should elevate the Commission to deal with the non-compliance of road safety standards.